The EAB reports a “growing need in the public and private sectors for individuals with the knowledge and technical skills to select, preserve, maintain, and archive digital resources.”  Their study finds 42% of digital curation jobs that advertise salaries offer higher than $75,000, while 80% advertise salaries above $50,000. 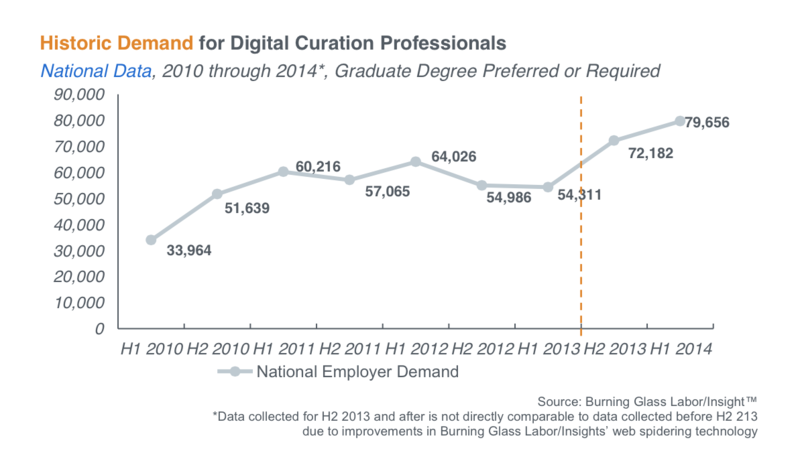 A statistic from the EAB that may surprise some observers is that last year some of the fastest-growing sectors for digital curation jobs included education, science, and healthcare. It seems that the skills that are increasingly proving essential to today’s archives, museums, and libraries will soon be needed in research labs and hospitals as well. The report highlighted the University of Maine’s “free online tutorials that foster individualized learning” to help accommodate “students’ varying levels of technological knowledge.” U-Me is also one of the only programs to furnish out-of-state students with a tuition comparable to that for in-state students. This past semester, the introductory class DIG 500 covered everything from visualizing data to 3d-scanning to building online collections. This spring we offer online classes in metadata (DIG 510) and digital preservation (DIG 550). Alvarez Diaz, Natalia. “Market Demand for Digital Curation Master’s Degree Programs.” The Education Advisory Board. November 2014. http://www.eab.com. Patricia R. Zimmermann liked this on Facebook.